Quite recently, we discussed the North Korean response to the UN sanctions resolution, noting that from the North Korean side, the raising of the rates was minimal. However, this was only sufficient until a new round of retaliatory moves, which, in the author’s view, increased the likelihood of a conflict on the Korean peninsula by another five percent. 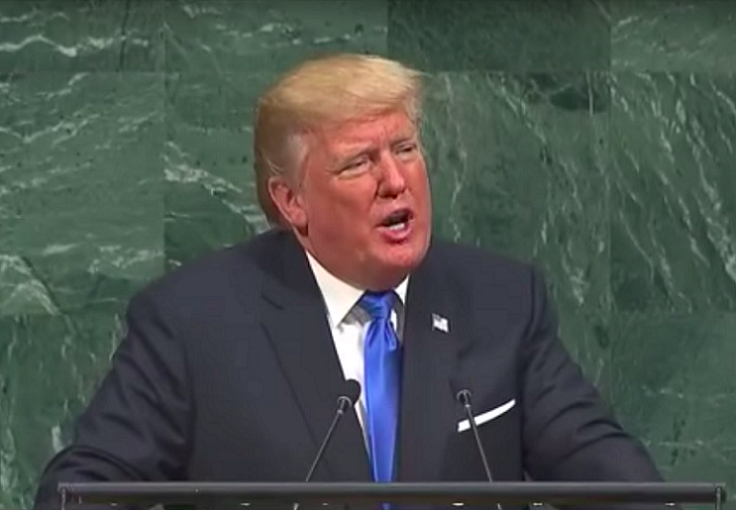 The highlight of the program was a speech by Donald Trump on September 19, 2017 at the UN General Assembly, which had a rhetoric that at times resembled a sermon before a pogrom. “The scourge of our planet today is a small group of rogue regimes that violate every principle on which the United Nations is based. They respect neither their own citizens nor the sovereign rights of their countries. If the righteous many do not confront the wicked few, then evil will triumph…The United States has great strength and patience. But if it is forced to defend itself or its allies, we will have no choice but to totally destroy North Korea. » The leadership of this country was described as a gang of criminals responsible for the starvation of millions of people in their country while torturing, killing and harassing many others, and Kim Jong-un himself was named a “rocket-man,” who is participating in a “suicide mission for himself and for his regime”. Such harsh statements are a very troubling sign. Firstly, if the North Korean statements that run along the “we will bury you” lines are traditionally perceived as propaganda rhetoric, the American ones are indeed pulling on a real threat. At the same time, such threats from the rostrum of the United Nations formally indicate that this destruction will take place with the approval of the “international community”. Secondly, given that in the same speech, Trump talked a lot about non-interference in the affairs of other countries, it turns out that there are civilized countries in respect of which these rules work, and other rogue states that can be destroyed with impunity. Thirdly, Trump’s statements are an obligation that both his critics and outside observers will later always be able to remind him of. It is one thing when Trump-the-man writes about “fire and fury” in the private space of his Twitter, and quite another when Trump-the-president openly makes statements in support of such things from the UN rostrum. Here, we note that in doing so, Trump did not pursue any “red lines” of the category “we will destroy the DPRK, if it …” say, it commits a provocation against the South or its missile falls in the territorial waters of the United States. This is very important, as, in this case the US president will decide for himself what is enough as an excuse for destruction and what is not. A little later, on September 21, Trump announced new economic sanctions against North Korea and countries that conduct business with the DPRK: “Tolerance for this disgraceful practice must end now.” According to these, the United States is imposing a 180-day ban on airplanes and ships that previously traveled to the DPRK from visiting the country. In addition, the US Secretary of Treasury is now able to block any funds flowing through bank accounts linked to the DPRK, and to impose sanctions “on persons engaging North Korea in such industries as construction, energy, finance, fishing, information technology, medicine”, and people involved in the mining, textile and transport industries,” as well as “any foreign financial institution that knowingly conducts or facilitates any significant deal with North Korea“. It can be said that the concept of a secondary boycott has acquired its legal embodiment. At the same time, the United States is trying to persuade the countries of the world to strengthen measures of pressure on the North. In the short time since the beginning of September, DPRK ambassadors were declared persona non grata in Mexico, Peru, Kuwait and Spain. Philippine authorities have declared a discontinuation of trade relations with North Korea. Thailand has announced a reduction of its economic cooperation with Pyongyang, and even the government of Taiwan has joined the sanctions regime of the UN Security Council and completely banned the export of purified oil and liquefied gas to North Korea as well as the import from it of fabrics and ready-made sewing products. All of this was, of course, expected. Back in April, Secretary of State Rex W. Tillerson called on all states to either suspend or downgrade diplomatic relations with the DPRK, and threatened to impose sanctions on foreign companies and people supporting the DPRK without hesitation. All this is also being complemented by ongoing muscle games. On September 18, the air forces of the ROK and the United States conducted another joint exercise in the sky over the Korean peninsula involving two B-1B Lancer strategic bombers (here, we shall recall that their previous departure was August 31). On September 21, the United States and the ROK conducted artillery exercises involving units of the Eighth Infantry Division of the United States Army stationed in the ROK and the 18th Field Artillery Brigade based at Fort Bragg Garrison in North Carolina. On the same day, the joint marine infantry exercises, which involved the use of equipment and aviation as part of the regular maneuvers of the Korea Maritime Exercise Program (KMEP), ended. It is also reported that in early October, the United States and Japan shall conduct joint exercises on the prevention of a missile threat, while the navies of the ROK and the United States are organizing exercises involving the nuclear-powered carrier “Ronald Reagan”. Add to this the results of a poll carried out on September 15 by the Gallup agency between September 6 and September 10 among 1022 United States residents. 58% of the respondents agree with the need for a military strike against North Korea in the event that diplomatic and economic ways of solving the North Korean problem prove to be unsuccessful. At the same time, 50% of the survey participants believe that the North Korean problem can be resolved peacefully by political means, and 59% believe that a strike by Pyongyang on the United States would have a low impact . South Korean public opinion looks similar: 76% of respondents believe that the sixth nuclear test of the DPRK poses a threat to the ROK. 37% of respondents gave an affirmative answer to the question of the possibility of the beginning of a war with the North, while 65% indicated that any assistance to the DPRK should be stopped completely, although only 33% of Koreans supported the possibility of a US preemptive strike against the DPRK in the event of a North Korean nuclear threat. The North Korean response was not long in coming. At the beginning of September 20, Head of the North Korean Foreign Ministry, Ri Yong-ho, compared Trump’s statements about his willingness to destroy North Korea in the event of a direct threat with a “dog barking.” But then, the “rocketman” immediately personally made a counter response. And although the invective rhetoric took a couple of new heights, if we put the insults in parentheses, the point is as follows: the US actions “do not intimidate and do not stop me, but, on the contrary, they confirm that the path I have chosen is the right one, and I should go on with it to the end”. As for what will happen next, we will wait and see, but sometimes, it seems to the author that, consciously or not, Trump is trying to solve the difficult choice he is facing, which is analogous with the US plan to join the Second World War, which some conspiracy theorists attribute to Roosevelt. Roosevelt himself was allegedly hampered by the isolationist lobby to launch this start. However, in 1941, America imposed a fuel embargo against Japan. After that, the country of the rising sun should have either shamefully renounced all its conquest, or been forced into a war with the United States, and as its initiator, and after the “Date Which Will Live in Infamy” at Pearl Harbor, all the questions were dropped. Here, again, one can imagine a strategy aimed at creating the impression on the young and impulsive North Korean leader that he has been finally cornered, and that the only way out is through a tough and effective demonstration of power. An inappropriate move of any kind that can be used as a casus belli will solve all the problems of the USA. It is one thing to start a war by using the pretext of “reasonable suspicion”, and another when there is an obvious act of aggression. The consequences of the conflict can also be attributed to Pyongyang. However, despite the American rhetoric, the voice of reason is also heard quite loudly. Here, even the Minister of National Defense of the Republic of Korea, Song Young-moo, while speaking at a meeting of the relevant parliamentary committee on September 18, announced that only 10% of the motivation of the North in this matter is connected with the desire to ensure the stability of its regime. The other 90%, the minister stressed, is due to a sense of a military threat from outside. In a similar vein, German Foreign Minister Sigmar Gabriel spoke in an interview with the newspaper Bild: The North Korean nuclear issue will be resolved by providing the DPRK with the necessary security guarantees. Pyongyang is developing a nuclear missile program because it believes that then, no one would be able to threaten it. And, probably, that is why, apart from the US and the ROK, the PRC and the Russian Federation also began displaying some force. As reported by Reuters, giving reference to the Chinese news agency Xinhua, on September 18, Russia and China began conducting joint naval exercises near the shores of North Korea. Russian nuclear strategic Tu-95-MS bombers also flew over the neutral waters around the Korean peninsula, accompanied by Su-35S fighter planes, just before the next B1B flight. It may be recalled that, during the previous spring aggravation, the flagship of the Pacific Fleet, the Russian Navy missile cruiser “Varyag”, as well as the average sea tanker “Pechenga”, both entered the largest port of South Korea, Busan, pouring water onto the hotheads. In general, as Head of the International Committee of the Federation Council, Konstantin Kosachev, noted, “Moscow will not allow Washington to unleash an armed conflict at its borders.” However, the author likens the situation to a flip of the coin, which, so far, has resulted in heads every time. Even so, every new toss is more complicated than the last, and the probability that the coin will sooner or later come up on the other side is not going anywhere. Having said that, observers are accustomed to the situation where the two sides exchange threats in an almost Khrushchev style, promising to “bury” (each other) and “turn” (each other) “into a sea of fire” several times a day, and are treating these threats as empty rhetoric beyond which there shall be no real action. From this, the confidence of a number of experts that, at some point, a hand of one of the parties to the conflict may accidentally quiver, logically follows.